Big news in Phnom Penh! Digby’s is serving the new king of burgers (despite the fact that there is now a Burger King at the airport). 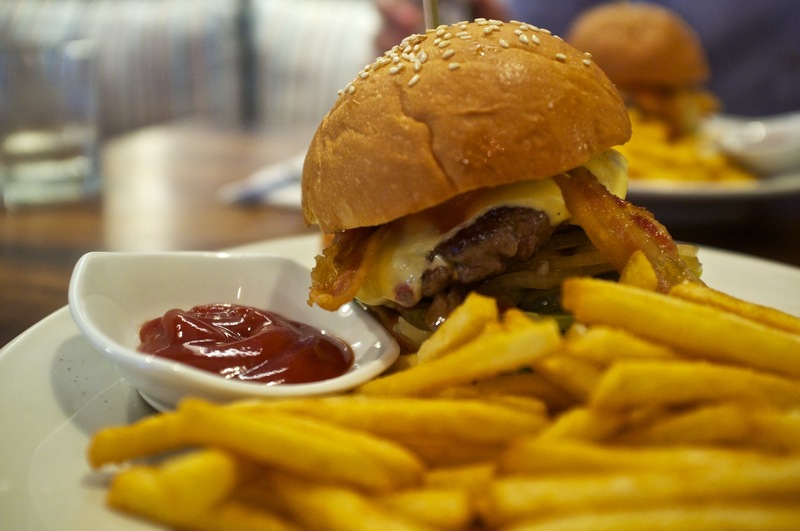 Digby’s is a really well done, Dean & DeLuca knock off that has opened up in the past six months and it is by far the best burger I’ve had in Phnom Penh. Great beef patty, bacon, cheddar, secret sauce on a sesame bun. Not cheap but really tasty. Being still new, it looks like the Digby’s Chef is still working out the exact recipe; I’ve been twice and the burger was a bit different each time but great both times. I haven’t tried many of the other menu items in the cafe but I’ve bought a few sausages to cook at home and everything has been awesome. The historic go-to butchery in Phnom Penh has been Dan’s Meat which is a no-frills shop with a decent assortment of sausages and meats. Digby’s leapfrogged Dan’s and has about 3x as much sausage available, meats, cheeses, a fancy grocery store and a cafe which great food. The exterior of the building is very dark and uninviting but the interior design was really well done with attention to detail. 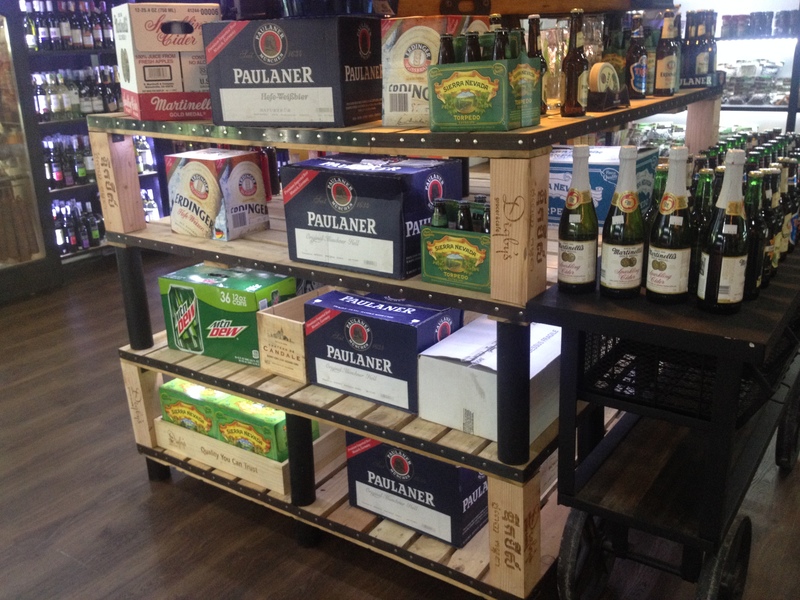 There are still reminders that we are in Cambodia (see Mountain Dew in the fancy beverage section). But if you haven’t been, definitely check it out. My interest in Digby’s was first piqued when it was just a butchery operating out of BKK1, and rumors swirled that they offered varieties of sausages in the double-digits. But it wasn’t until they began offering this vast assortment of meat treats cooked on-site at their Digby’s Café that I actually tried out their wares for myself. 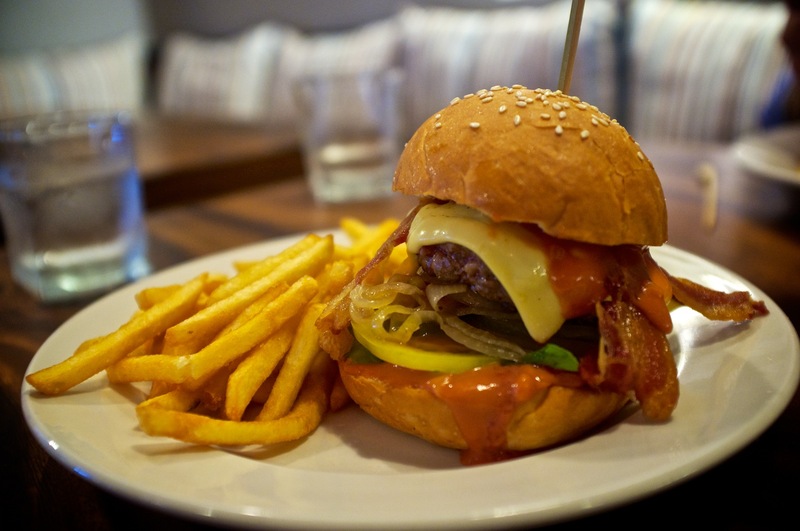 In addition to sausages, the café serves a variety of Americana-style sandwiches and a burger that some say is the best in town. Walking into Digby’s is astonishingly like walking into a fancy grocer in NYC. From the gleaming white subway tiles, to the industrial-chic lighting, to the inevitable sticker-shock, Digby’s definitely evokes nostalgia for those who have spent time in the Big Apple. It’s a beautifully well-done space, but I do wish their milk was a bit more reasonably priced. That said, their café menu is more mid-range in cost and quite excellent when you consider the quality of meat you are served. So how about taste? This trip to Digby’s was a mixed bag for me. I steered wrong from the beginning, ordering the pulled pork sandwich. While the pork was amazingly tender, I had a hard time tasting it as it was drowning in sauce that was at least 50% Liquid Smoke. 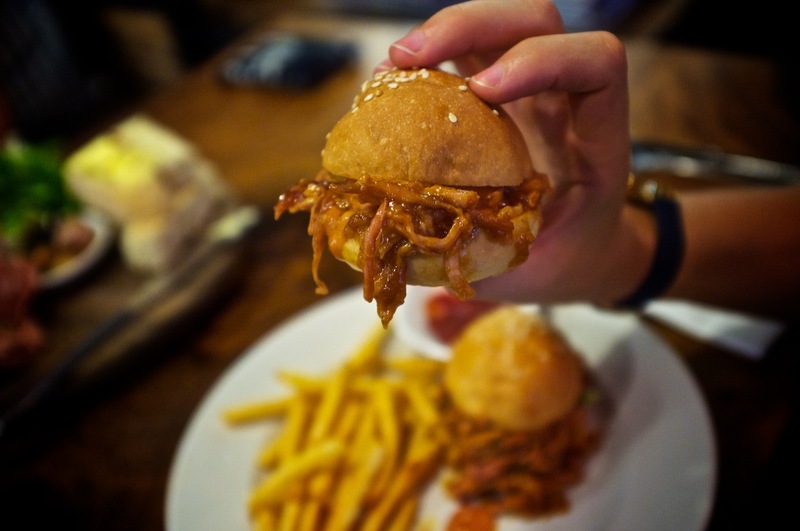 Kind of like eating a campfire… My expectations were high for the burger and it was quite good, though there are a few other Phnom Penh burgers higher on my list. The patty was delicious, bacon cooked to perfection and the bun was delightful. However, the burger had that same mystery smoke sauce. 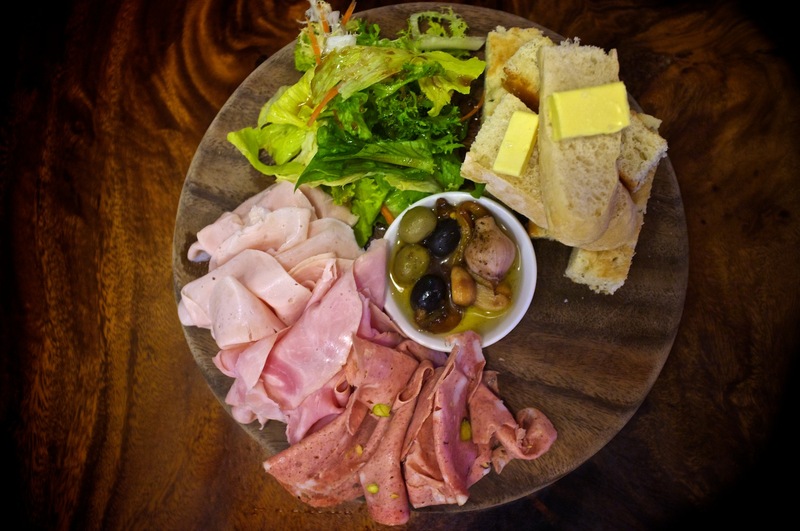 Another diner ordered the meat platter, which was visually gorgeous and piled high with charcuterie, fluffed greens and chunks of bread n’ butter. But the show-stopper was the cheesecake. Ordered as an after-thought and only after strong encouragement from the only sweet-tooth in our bunch, it was the best cheesecake, perhaps best dessert, I’ve had in Phnom Penh. So good it deserved a GIF! Overall, I’d recommend checking out Digby’s for a meal, perhaps ask for the smoke sauce on the side. You can also select one of the 12+ sausages and they’ll grill it up then and there, served with baguette and mesclun, for about $2, which makes for a great lunch. And definitely pick up a couple of sausages and bottles of Sierra Nevada to take-home. 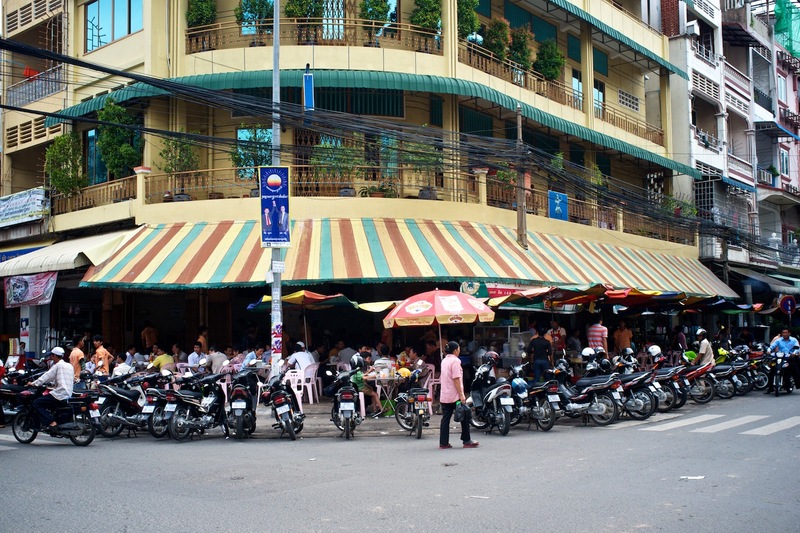 On the corner of streets 136 and 13 there is a typical Cambodian grilled pork and rice breakfast restaurant. The reason we decided to check out this restaurant, which is apparently called “126”, is because there were reports that they had the best rice and pork in Phnom Penh. 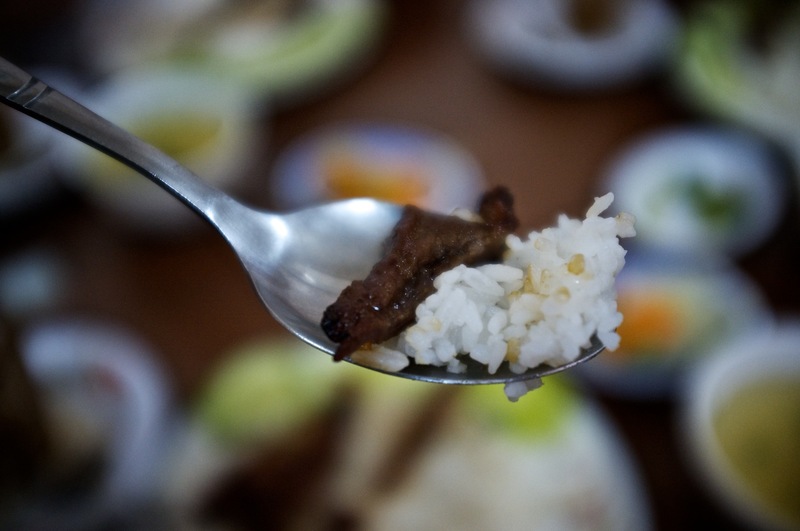 For a bit of background on breakfast rice and pork, or bai sach chrouk, check out this Phnomenon post from a few years back. First of all, Cambodian pork and rice isn’t my favorite breakfast. It’s not bad but definitely not exciting. It’s a relatively safe order when out in the field but I’ve never had a craving. But after hearing that this was the best in town, I was excited. Vinh and I had checked out the well known Sovana BBQ restaurant for breakfast a couple of years ago and their pork was solid but it has been a while since I had really good pork and rice. Unfortunately, with the build up, it was a let down. Decent rice and pork but nothing that made it stand out from any other restaurant in Phnom Penh or out in the Provinces. It’s really just rice and grilled pork. Not particularly amazing pork, no special sauce, Cambodian white rice; that’s it. The coffee wasn’t bad, strong and sweetened with condensed milk, and the place was packed so there was high turnover on the grill which is good. However, the soup was basically just liquefied msg and had a weird fishy flavor. Overall, it’s not a bad place to bring an out of town guest for an experience but I’m in no rush to go back. I am not a morning person, but if there is one thing that consistently causes me to peel my eyes open and get out of bed before 8AM on weekdays, it is food. 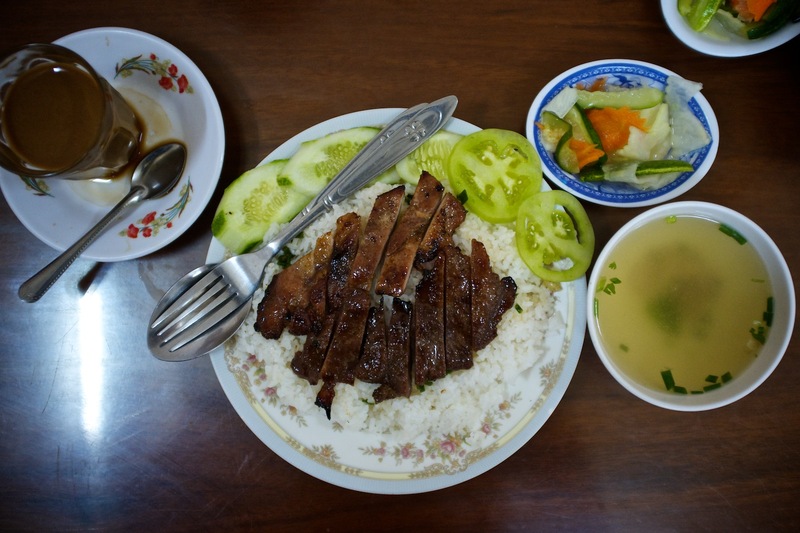 Cambodia is well-suited for those with raging early-morning hunger pangs, as it offers a particularly hearty breakfast dish – bai sach chrouk (rice and grilled pork). 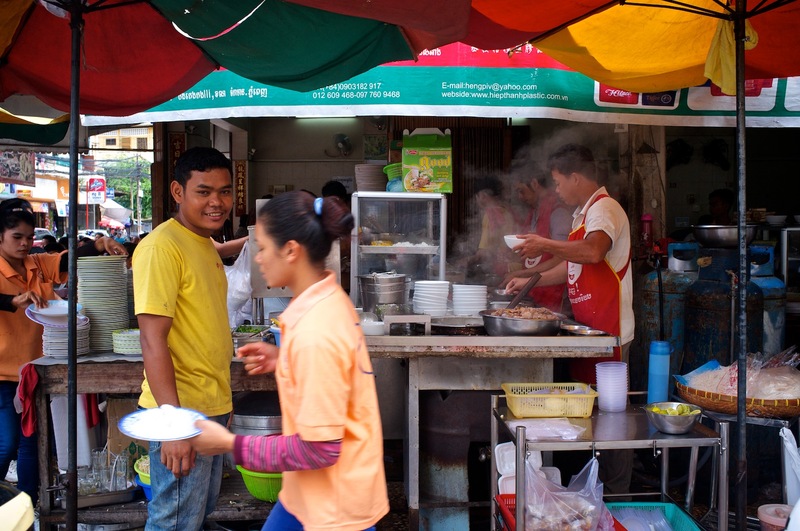 Despite two years in Phnom Penh, I had yet to try the dish. Having heard a strong recommendation, claiming ‘Restaurant 126’ to serve some of the best in town, we decided to see if it was worth the 7AM wake up call. While my taste buds may have been over stimulated by the adrenaline of trying a new dish and disoriented by the early hour, I thought the pork and rice was pretty tasty. The pork was sweet, flavorful and grilled to perfection; reminded me of eating a thick slab of bacon with maple syrup…Hard to go wrong there. The counterpart to this dish was basic, pretty mediocre, white rice, but it served its purpose as a blank canvas for the pork. 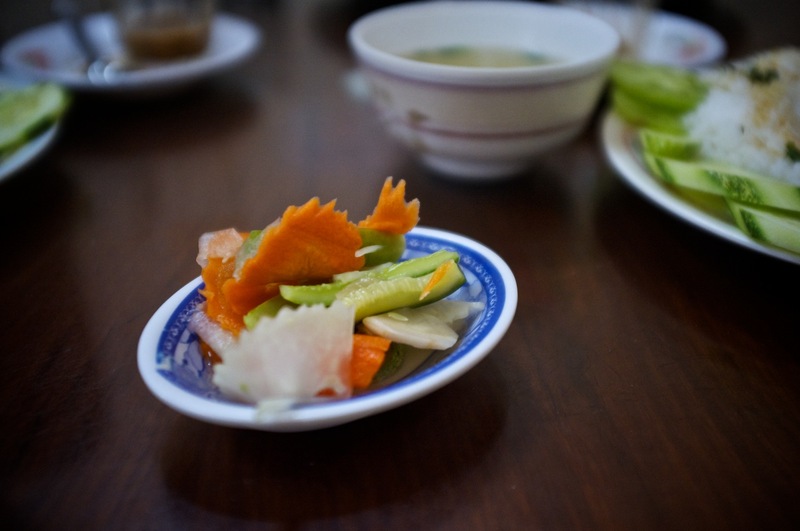 Along with the pork and rice, diners receive a small bowl of broth and a dish of pickled vegetables. The broth was also nothing to write home about, salty and hot, but a nice contrast to the sweet pork, as well as adding another flavor option for the rice. The pickled vegetables were a showstopper though; carrots, cucumbers, and jicama all mildly pickled with a sweet tang and light crunch. I could have eaten everyone’s serving. We all accompanied our breakfasts with hot coffee. 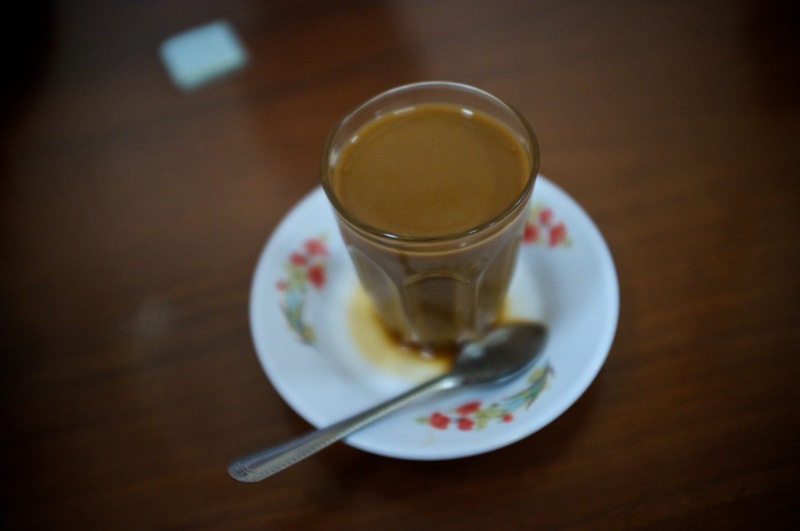 Though tiny in size, it packed a strong, intensely sweet punch, thanks to a generous dose of condensed milk and that characteristic chocolate-y flavor of Cambodian coffee. While I don’t think I’ll make ‘Restaurant 126’ a regular morning routine, it was fun to wake up early and share my first meal of the day with a crowd. And I wasn’t hungry again until mid-afternoon.